There is a lot to like about NOse Offense, in fact so many things I am going to put them into bullet points for you. Fragrance-Free! 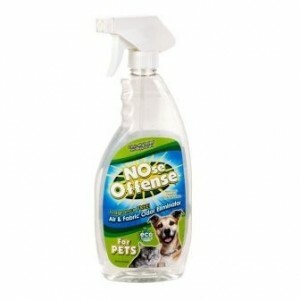 A completely fragrance-free odor neutralizing spray that eliminates all pet smells. Creates a scent free environment. No masking with flowery scents, just clear clean air. The patent pending formula has gone through extensive and varied clinical trials to confirm the formula is free of toxins. Using EPA approved protocols when undergoing these tests, NOse Offense For PETS has been found to be non-toxic for oral toxicity, skin sensitivity and ocular & inhalation irritation. NOse Offense is safe, non-toxic, organic, biodegradable and manufactured to be 100% free of enzymes, alcohol, phenol & phenol derivatives, phosphates and phthalates. The active ingredients in NOse Offense For PETS are proprietary zinc salt, emulsifiers, preservatives and proprietary odor counteractants. This ingenious product can be sprayed directly onto all water safe fabrics and in litter boxes, cages, curtains, carpets, clothing and blankets. Just one or two sprays in the air and the odor is gone. 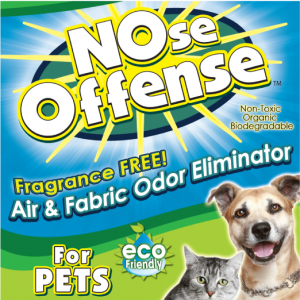 The goal in creating NOse Offense was to create a super effective, green, economical, safe and fragrance-free environment for pet owners. We are using NOse Offense and let me tell you this is one great product! We sprayed NOse Offense in the litter boxes after their cleaning and there is no more lingering cat pee smell. I sprayed a little around the floor surrounding the boxes. I love that this product is fragrance-free. I have a low tolerance for perfumes and strong masking fragrances. I sprayed inside the kitchen trash can. Voila! No odor! So then, I thought, what about the big green garbage container. I won’t tell you that you will love the way your garbage smells, but what I can tell you is that you won’t smell your garbage any longer! During the hot and humid days of summer, our big trash container begins to take over the garage with its nasty odor. It had gotten so bad, we had to keep the can outside the garage this summer. I decided to spray attack our big green container when I brought it back in from the curb on trash day. I couldn’t believe it, but NOse Offense worked its magic and we have taken back our garage and I don’t have to see that big green container in our driveway either. If you would like to try NOse Offense, Jaime from Rembo Corp is so nice, she is offering friends of The Tiniest Tiger a 20% discount good for one week from the date of this post. Never heard of this product before. Will have to give it a try. Thanks.